The Devil's Kitchen: Oh yeah? So what has happened for the last ten years, exactly? Over at the ASI, they are posting some of the winning entries of the Young Writers on Liberty. 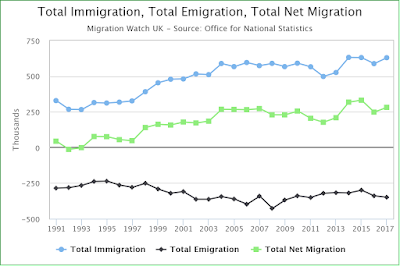 One does not want to put such keen minds off, but there are some slightly odd assertions being made: let us take, as an example, the essay titled Immigration is key to solving the productivity crisis. Currently the UK falls significantly behind the levels of productivity in similar countries. Between 1997-2007, average productivity grew by 2.1% each year: only 0.01% behind America. But from 2007-2017, the UK has only experienced an average of 0.2% productivity growth per year, falling behind America, Germany, France and more. The financial crash of 2007 is partly to blame for a decrease in productivity, as experienced by all countries worldwide, however the UK has not recovered as well as other countries and this can be put down to poor policies which do little to boost our productivity. Well, there is very little to disagree with here—our governments have been spectacularly rubbish, for sure. Immigration is a key policy area which will need to be addressed to increase productivity. Many overlook the advantages of skilled migrant workers in an economy as it is argued that they “steal jobs” from UK citizens. It is also claimed that migrants are a burden on our economy and welfare system. In reality, migrants do not crowd out employment (the so-called 'lump of labour' fallacy) and many take up lower-skilled jobs that UK citizens do not want to carry out. OK, so we have a definition problem here: skilled migrants, by definition, do not take-up "lower-skilled jobs"—and I don't think that you'll find many people objecting to skilled migrants. But, as pointed out by Alex Noble at the Continental Telegraph, we need to define our terms and understand what we want. So far so good—we need a supply of skilled migrants for the foreseeable future. Hopefully we can all agree on that. Do we need unskilled migrants? Because when people with no skills come to the UK, we suffer and so do they. They are either forced into crime, fall into modern slavery, or find themselves exploited working on the black market. Therefore it is clear that migrant workers are a vital part of our economy. Policies need to be put in place by our government to allow free movement to continue if our economy is to become more productive. Also we need to allow workers to come into our economy to fill occupational shortages. If we have occupational shortages and no migrants fill the places due to government policies creating a barrier to their entry, we will have failed in boosting productivity and becoming a more diverse, rich society. Skilled migrants might do—but it is not clear that all migrants do. And I am very far from convinced that becoming a "more diverse" society is necessarily what the British people want: some large proportion of them do not—there are many memes mocking the "cultural enrichment" of this country. But leaving aside the potential damage that "diversity" does to a demos, this argument ignores the progress of the last ten years: a decade during which, apparently, our productivity has fallen off a cliff. Has the last decade seen a notable drop-off in immigration? 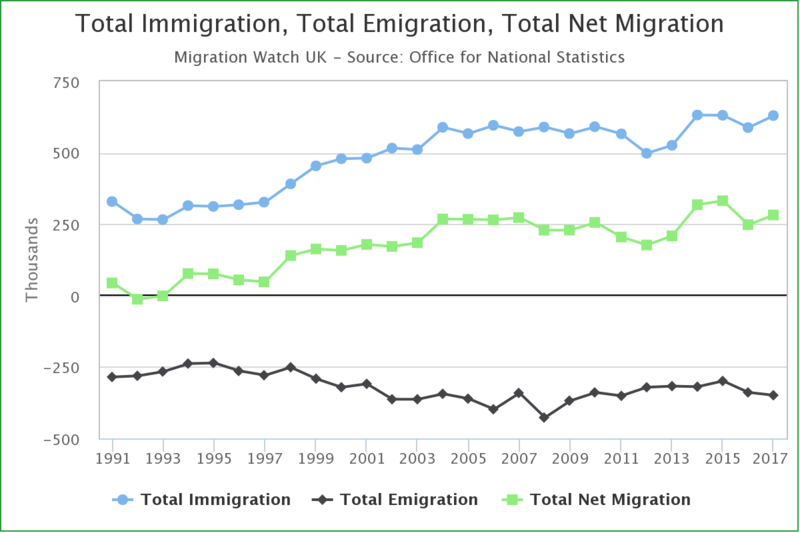 No, it has not: in fact, net migration has pretty consistently increased over the last decade. So, I am confused: if immigrants are so good for productivity, then why has the last decade seen so little improvement in said productivity? There are a number of possible answers to this question—with the idea that we are counting wrong being one of the more credible. However, let's be clear: productivity is, essentially, a function of output and the hours that go into producing said output. And whilst high-skilled migrants—your computer programmers, etc.—might well boost this measure, a great number of migrants are doing low-skilled, low productivity jobs. Indeed, a number of skilled migrants are doing low productivity jobs—such as nursing. Yes, we need nurses but working in our health service—prone, as it is, to Baumol's Cost Disease—does not increase productivity by any significant amount. In fact, needing to recruit more nurses from abroad is a symptom of the very problem that we are examining—if productivity were increasing in the NHS, we would not need so many nurses. Regardless, I am not convinced—on the evidence of the last decade—that immigration (skilled or unskilled) are the secret sauce to an increase in productivity. Lots of immigration hasn't solved our productivity problem... so clearly we need even more immigration. The left likes to argue like this: Big government hasn't solved X, so what we need is... even more government. To what extent has productivity stagnated because more and more people are actually working hard doing nothing useful and producing nothing of value? i.e. much of the public sector, all "compliance" activities, drones like HR, and so on. "To what extent has productivity stagnated because more and more people are actually working hard doing nothing useful and producing nothing of value?" The terrible thing is that from a statistical point of view a person sat in an office 'working' for the State (but producing nothing) can actually result in an apparent increase in productivity. This is because State jobs are credited with producing the same amount of value they cost. Employ a 'race awareness' adviser on £30k yr, its assumed their output is worth 30k/yr. So if you ramp up the minimum wage and throw the marginally productive out of work, and employ lots of extra bureaucrats on fat salaries doing SFA, and your productivity figures go up. Because the out of work aren't in the productivity figures. This is why a high unemployment country like France has higher productivity - they just chuck all the marginally productive people on the scrap heap, whereas here they do minimum wage jobs in the gig economy or suchlike. If State employees were valued on actual output the productivity figures would be horrendous. So - not sure how the calculations works - I assume if an economy creates loads of jobs such as this which are not productive (in a GDP sense, much, if at all), and then imports loads of people (skilled or unskilled) to do this then surely this may account for some - if not all - of the crap rate of productivity gains (productivity being calculated from increase in GDP vs total hours worked). This seems pretty obvious to me. Am I right? Or is this overly simplistic (And been debunked somewhere)?! Hello by the way - not read here for a long time, probably for 3 years or more. Thought I would drop back in here and have a look as I am waiting for a colleague to do something for me. I just had an urge to comment here as this productivity thing has been itching away at me for.. oh... a couple of years I would say!